GEAR Solar's Solarpac TS-2400 and TS-3600 non-pressurized self-contained tank systems are equipped with our premium Solarpac evacuated twin-glass tubes without the heat pipes. Whenever you see a solar collector and a cylinder located immediately above it, you are very probably looking at a thermosyphon solar system. 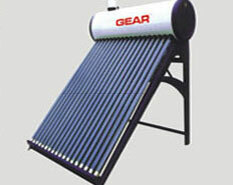 Thermosyphon systems are simple and reliable and one of the most common solar water heating system in use worldwide. Thermosyphon systems in their typical configuration do not have pumps and other controls. Gravity powers convective flow in a thermosyphon system. They are based on the natural convection principle: hot water rises and cold water sinks. Water in the collector becomes buoyant as it is heated, and it rises to an elevated tank. Cooler, heavier water falls from the tank to take its place. Greater height differential will result in greater flow. Larger pipe, shorter runs, and gentle bends will make for an adequate flow rate. The big disadvantage or limitation of thermosyphon systems is that they depend deeply on air temperatures. To be more precise, they will stop working if temperatures drop below the freezing point and stay there for long. In that case the system needs to be drained or warmed. To overcome this limitation, in cold climates, some manufacturers equip their thermosyphon systems with small circulating pumps - pumps that are turned on in very cold weather conditions to move water and to prevent the one in the collector from freezing. Another possible disadvantage of this system – when installed on a roof – is their high weight. A tank full of water weights many gallons, and that may require the reinforcement of roof structures. These types systems are commonly used on farms, greenhouses and nurseries and camping facilities. Available models are a 50 gallon tank and a 100 gallon tank. Mounting stand is included.